But she too was once a slave, plucked from her home, chosen by the Eyes to live in service to them, as much a slave now as she ever was. And with her sight into past and future, she can see the secrets of the Eyes–and the evil of the Eyes. 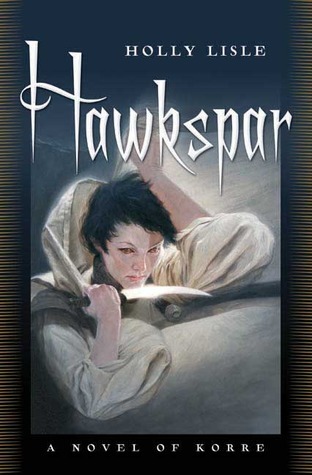 Before the death of Hawkspar, another must be chosen by the Eyes–but the avatar has her own plans, and chooses a slave for her courage and rebelliousness, rather than her dedication to the goals of the Eyes. So, yeah, apparently this is the second book in the world of Korre, but it is a stand-alone book. I do feel like you would know more about the magic of the Tonks, the people of the Hawkspar, if you had read the first book, Talyn. But I haven’t and the book and I got along just fine (though now I have to read the first one). There is a darkness to this book, but the author still manages to fill it with hope. I personally love a dark story, but also want a happy ending. I’m a contradiction, I know. Anyways, Hawkspar, the one chosen after the original dies, has it rough. Not only is she a slave, but now she’s been chosen to have her eyes plucked out, essentially blinding her, and stone magical eyes put back in. She is a strong character who because of facing her fears for her people is also courageous. She has wants and needs, but she makes sacrifices constantly for what she believes is right. So, she’s pretty cool. But this story isn’t just told from her perspective, but also a man who is trying to help her. And while her side is written in first person, his is written in third. It actually helps to differentiate who’s side your reading, if you’ve forgotten. His name is Aaran and he is strong because of his weakness, his search for a long lost sister. He is also intelligent, and pretty hot. I said this story was full of hope, but it is also the story of family, of the strong ties a family can have, of the comfort of being a part of a family, and sometimes choosing your own family. My brother is about to have heart surgery, so maybe this spoke to me more than others. It was pretty well paced and overall was a satisfying read. If you want something a bit different and a bit dark, try this out.